On 18 December 1999, Bev Elliott managed to take some photographs of a dead basking shark on the rocky shores of Mudstone Bay, Kaikoura Peninsula, New Zealand. As we had documented another washed up basking shark in Kaikoura (Kaikoura-1 carcass) in Journal of Creation earlier that year,1 we decided it was not necessary to address this second find. However, revisiting the pictures of this carcass during the preparation of the article on ‘Parkie’, a pseudoplesiosaur find in Nova Scotia, on pp. 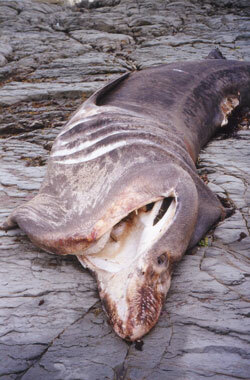 109–118,2 revealed some important complementary evidence for the basking shark identity of these carcasses. 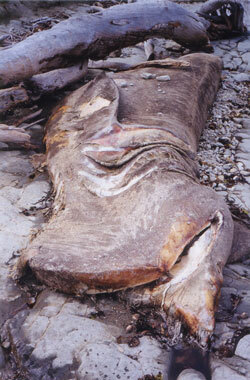 Our original aim in 1999–2000 was to take pictures of the carcass at different stages of decomposition to illustrate how these large sharks turn into monster-like creatures. The carcass from Mudstone Bay was initially complete except for the front dorsal fin which had already been removed (fig. 1). 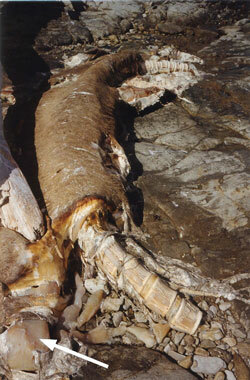 The first pictures of the dead basker were taken when it was initially spotted lying on the shore of Mudstone Bay, and then again 12 days later on 30 December 1999. During these twelve days, the carcass had been turned around 180° by the tide, but there were no major morphological changes (fig. 2). The carcass was visited seven days later (day 19) but there was only minor visible deterioration and some noticeable sloughing of the skin. The next visit was only possible on 24 January 2000 (day 37 after the original sighting), and revealed a carcass that had undergone a surprising metamorphosis (fig. 4)—the tide waters had also wedged the carcass under a log. Unfortunately, this meant that a lot of detailed changes during this period of decomposition could not be recorded. In comparison, the Kaikoura-1 carcass had taken noticeably longer (about 6 weeks) to turn from a rotting ‘mess’, such as Parkie, to looking like a plesiosaur. By day 37, there were no remains left of the shark head or of the plesiosaur-like cranium. At this stage, there was also plenty of skin covering the torso, but the carcass appeared to have lost all but one of its fins. It is important to note here that the main reason why the remaining skin was not sloughed like that of the Zuiyo-maru carcass (ZMC) fished up off the coast of New Zealand in 1977 was that this carcass had spent most of its time out of the water, and, as a result, the skin had simply dried out. 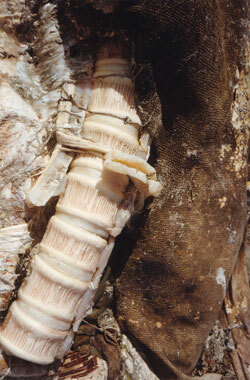 The remains of a large cartilage bone partially covered with skin close to the neck vertebrae indicated that this was part of the pectoral fin. Was this the ‘bone’ Michihico Yano felt when he trod on the fins of ZMC?4,5 There was visible sloughing of the skin on the dorsal area, but the most important feature was the structure of the neck and tail vertebrae (figs. 3 and 4). These were block-shaped/cylindrical and without vertebral processes, and typical of all the basking shark carcasses we have described so far, including those of ZMC. The evidence documented here shows how different a decomposing basking shark can look when compared with the original creature, and is further support for how basking shark carcasses can be transformed into ‘pseudoplesiosaurs’ and headless sea monsters within as little as five weeks. It reinforces instead the need for rapid burial processes, such as those resulting from the universal Flood, for conservation to occur. Moreover, this rapid decomposition reinforces the problem with the uniformitarian assumption that complete fossils can be produced by slow and gradual processes while a carcass is slowly buried by gradually accumulating sediment. It reinforces instead the need for rapid burial processes, such as those resulting from the universal Flood, for conservation to occur. The illustrations shown here, together with those of our previous articles, and especially those in the full article featured in this issue, are further confirmation that many of the rotting marine ‘monsters’ found around the world are simply basking sharks. Jerlström, P. and Elliott, B., Letting rotting sharks lie: further evidence for shark identity of Zuiyo maru carcass, Journal of Creation 13(2):83–87, 1999. Return to text. 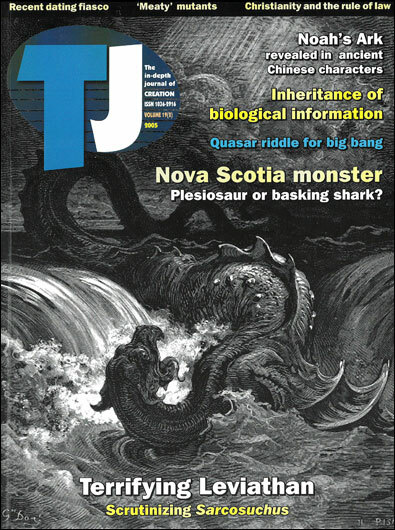 Jerlström, P. and de Roos, H., Parkie; a new ‘pseudoplesiosaur’ washed up on the Nova Scotia coast, Journal of Creation 19(2):109–118, 2005. Return to text. Hoelzel, A.R., DNA identification of basking shark Cetorhinus maximus products in trade: Report submitted by the United Kingdom in support of proposal 11.49 to add Cetorhinus maximus to Appendix II of CITES. Return to text. Obata, I. and Tomoda, Y., Comparison of the unidentified animal with fossil animals, p. 49; in: Collected papers on the carcass of an unidentified animal trawled off New Zealand by the Zuiyo-maru, Sasaki, T. (Ed. ), La Société Franco-Japonaise d’Océanographie, Tokyo, pp. 45–83, 1978. Return to text. Figure 2d; in: Jerlström, P.G., Live plesiosaurs: weighing the evidence, Journal of Creation 12(3):339–346, 1998. Return to text. Bev Elliot is a seacare member and patrols a 26-kilometre stretch of beach on the Kaikoura peninsula of New Zealand. She has been a supporter of Creation Ministries International since 1988 (called Creation Science Foundation then!). Her interests include bird watching and photography, and she was, until recently, an ardent supporter of the plesiosaur identification for the Zuiyo-maru carcass. Return to text.